Elephant pants are ubiquitous in Thailand– you’ll find these iconic printed pants with banded elastic cuffs at every market, usually for under $5. But while these billowy pants feel hippie-chic in their natural environment, can they really be worn back home? Or do they suffer the same fate as bridesmaid dresses, suitable for the occasion, but never really meant for everyday wear? These are the questions that came to mind as I shopped elephant pants at Chatuchak market in Bangkok. For five bucks, I figured it was worth the gamble to take the elephant pants home for a road test and see if I could make them work on the cut-throat fashion streets of Manhattan. Until, that is, I arrived back home, unpacked my suitcase and realized I forgot to buy the darned pants (note: buy it when you see it, a rule I preach and should follow more often). Fortunately my shopping buddy Anne came to my rescue (see how Anne styles her pants below) and gifted me an authentic pair she bought on the streets of Bangkok. For this Thai elephant pants challenge, I was hoping to get a few takes so I reached out to my my traveler community in search of participants. 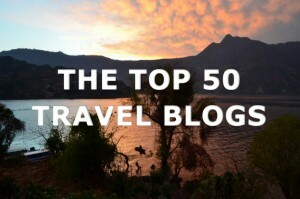 The response was not exactly overwhelming, but two fellow travelers agreed to share the results of the challenge here. My Road Test: Can Elephant Pants Work on Streets of One of the World’s Most Fashionable Cities– New York? My first impression when I tried on the elephant pants– damn these are comfortable. My second impression– these pants are the single most unflattering thing I have ever put on. Plain and simple, I looked like I was wearing clown pants. I made my best effort to “tone down” the clown look. I added a crisp white shirt. Clown goes to the office. I tried a hip moto jacket. Clown fashion fail. But it seemed like no matter how I styled the elephant pants, I couldn’t get the circus out of my head. Finally, I gave up on finding something edgy to pair the pants with and went for straight-up simplicity, settling on a plain, fitted tube top. With a few adjustments to the pants (I rolled over the waistband and tucked the telltale drawstring out of sight), the pants did deflate a bit, and if I squinted I could almost pretend they were palazzo pants. Like any good fashion blogger, I decided to go for the “high/low” look, showing off my skill for effortlessly pairing five dollar pants with spendy accessories. I added my most expensive shoes (sample sale Manolos) and some gifted bracelets (Hermes and Julie Vos) and headed out the door. Following in the steps of my favorite fashion bloggers, I present my “modeling” poses– melancholy blogger carrying notebook for spontaneous sketching (Hermes natch) and the classic, three-quarter turn-to-make-these elephant-pants-look-as-slim-as-possible pose. So did the outfit work? In New York, everyone is so self-absorbed I doubt anyone noticed what I was wearing. That said, I’m not sure I’m brave enough to test this outfit out at a fashion event or a super trendy restaurant– it might just be a home office day kind of thing. 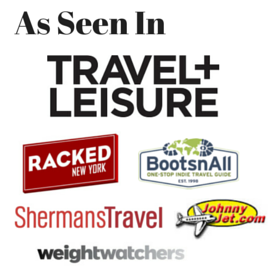 How did the other travelers fare? San Francisco resident Anne Lowrey has been traveling to Thailand and wearing elephant pants for years. But it’s one thing to wear elephant pants in Thailand or in the privacy of your home office. I challenged Anne to take her elephant pants out onto the chic streets of San Francisco. Anne easily pulled it off in that West coast, carefree kind of way. I love how Anne’s slim, but colorful tank adds a pop of color. The flip-flops keep it California casual. In this case, West coast definitely beats East coast. On my first day in Bangkok with @souvenirfinder a few months back, I told her, “We have got to get you some elephant pants, straight away.” (They’re a SE Asia travel wardrobe essential.) Initially skeptical, she later asked if I thought we could pull off wearing them at home. Challenge accepted. Erin strikes a wistful pose. Erin demonstrates the flexibility of the elephant pants with this power shot. Elephant pants are one-size-fits-all and are usually huge– like so enormous that you could gain thirty pounds and not even notice because they would still fit perfectly (which sounds pretty dangerous). So when I saw travel writer Erin’s slim looking elephant pants, I wondered if they were actually the same pants at all. Nicely done, Erin. Pro-tip– look for children’s elephant pants for a sleeker fit. While Erin looked pretty chic in her kid-size elephant pants, how would the pants look on an actual kid? Travel writer and mom Sally didn’t want to find out. Sally was mortified when her own mother gifted her ten-year-old daughter Alannah a pair. Sally had planned to use the pants as a dust rag, but when she saw my request, agreed to let Alannah style the elephant pants for this post. Alannah playfully peeks from behind a shrub for her model shot. Alannah also gives us an action shot, ready to take off on a bike ride. Sally gave Alannah complete creative freedom in styling her elephant pants while on a camping trip. Instead of going for an obvious matchy-matchy look, young Alannah thinks outside of the box and deftly pairs her elephant pants with a baby blue dog tee-shirt. This eclectic street style look, topped off with a pop of color in her turquoise footwear choice, reveals Alannah’s potential as an edgy fashionista along the lines of Chloe Sevingy. Alannah is not only naturally chic, but practical too and reports that the pants survived an action packed day filled with bike riding, sand sculpting and other camp activities. Who knows, Alannah’s look might inspire today’s children, ever seeking more comfortable clothing into a whole new look. Elephant Pants: Are US retailers Already onto this Trend? As soon as I started writing this post, I noticed that pants very similar to elephant pants were showing up everywhere in New York. Was this some new trend, started on the streets of Bangkok, that was now taking over fashion circles? I’m not sure but the reinterpreted pants definitely seem to have a sleeker cut and better fit. While I’ll still wear my elephant pants around the house (and maybe down the block to the bodega) I’d probably opt for a more updated version for a night on the town. Thanks again to Anne Lowrey of Part-Time Traveler for sending me the pants, and Erin of Traveling thru History and Sally and Alannah of Our3kidsvtheworld for their modeling shots! 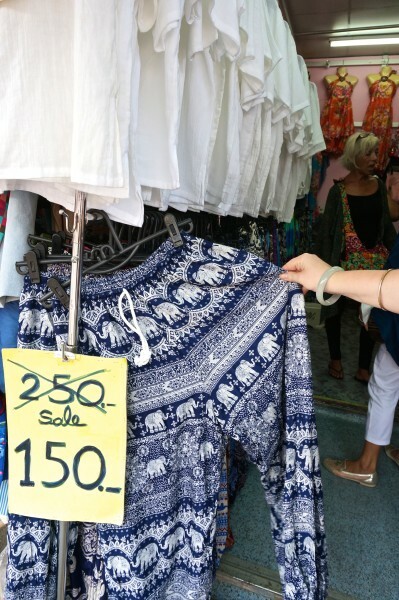 Readers, we want to hear from you– elephant pants back home, yay or nay? 17 Responses to Thai Elephant Pants: Can You Wear this Thai Souvenir Back Home? ooh I like it– just go with the whole cool casual look! This is such a great post! I love seeing the different styles of pants. I’m actually wearing the other pair I got (a teal flower pattern without elephants) right now. They’re baggier than my red ones, but still a bit too short. You can buy these in Bali for around $7 or now available in Australia for $20. In Target I bought an elephant jacket – same design – for $35! Thanks for stopping by Erin and reporting on your elephant sightings. Who knew, Target knocking off Bangkok street vendors! I had to look! Everybody buys them, I wonder what percentage of female travellers to Thailand goes home with a pair? I’d guess 90+ . I don’t mind them, but I didn’t buy. I like mine from India instead, less elephants, similar style but I don’t wear them much when we’re not travelling. And yes, there’s loads similar in the shops in the UK too. Found this while searching for a photo of these horrible yet ubiquitous backpacker garments, and despite my hate for them I LOVE that you’ve tried to incorporate them into your wardrobe back at home! Part of the reason I don’t like them (aside from the fact that they’re usually too saggy and have ugly patterns—sorry!) is because of their throw-away nature… I’d guess that about 90% of the Westerners who buy them on a backpacking holiday let them languish in their dresser back at home until they finally get chucked in the rubbish. What a waste! I think Erin’s smaller pants actually look okay. It’s unfortunate that the fast fashion shops here in the USA/Europe are still making them so baggy and ugly 🙁 I bought a slimmer pair in Myanmar for $3 that are black with small white horses, and they do just fine here in the streets of Berlin! Yes I agree– the smaller pants aren’t nearly so bad and just as comfortable. I’ll look for kids size next time I go! I haven’t been to Myanmar yet but those pants sound adorable. I brought home a pair of these for just about everyone in my family, and I don’t believe anyone, except maybe the 4-year-old, has worn them. I bought myself a plain black pair just for their comfort, but they are so gigantic I feel like a hot air balloon when I wear them. I can’t even stomach wearing them around the house. You made a valiant try at making them look good back home! The pants haven’t made an appearance since the “photo shoot” day lol. And OMG I love your pant post!! I am definitely going to bring them back and do the same– looks like an even greater challenge though! I’ve been recently sorting through my “souvenir mistakes” (currently as disappearing vignettes on snapchat) but hope to post more of them soon lol. I popped the elastic out of the bottom of the legs and love them as just flowy boho pants! I can’t believe I didn’t think of that! Great idea reduces the clown effect! If you take a gander through any of the random street fairs that seem to pop up in New York City in the summer time, you’ll find elephant pants for sale at at least one stall. I snapped a picture of them to share with the people I met when I toured Cambodia, adding in that they cost nearly three times what we all paid for them, AND didn’t come with the fantastic memories of a great trip! I wear my elephant pants all the time at home, everyone loves them. I bought mine in Bali. I bought a few pairs for friends and family, and they all love them, when I go to Bangkok I am going to buy many more. Hi Shelley! Haha I totally agree, so comfy and a great cheap gift item.